Acquired: Selected in the second round (16th overall) in the 2015 CFL Draft. Contract extended on Jan. 9, 2017. 2018: In 17 games (17 starts), Beard has lined at both guard spots and centre, he also has two total tackles and one fumble recovery. 2017: Beard appeared in all 18 games (seven starts) for the Green and Gold as well as the West Semi-Final and West Final. 2016: Beard appeared in eight games this season. 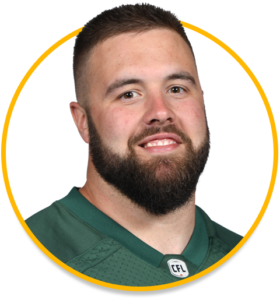 2015: Beard was drafted 16th overall (2nd round) in the 2015 CFL Draft and appeared in nine games this season.